Looking for somewhere to go tonight? 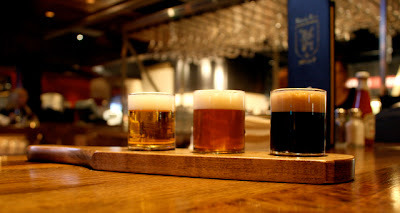 Just in time to quench your thirst for the last weekend of American Craft Beer Week (May 14th – May 20th), gastro pub, The Thirsty Lion Pub & Grill, in downtown Portland is unveiling an expanded new beer selection, while showing off their freshly renovated Old Town location. With Audio Syndicate playing indie rock classics on Friday night, you can count on a combination of great people watching, great beers, and selection of tasty bites. Happy Hour is 3 - 7 pm, and the dinner menu is more than hearty! With a booming selection of local craft beers, and now a rotating selection of 32 brews on tap featuring local producers like Cascade Brewing, Burnside Brewing, Fort George Brewery and Walking Man Brewing, this is a great place to toast to our region’s - and country’s - flourishing beer economy. Support American Craft Beer Week, while supporting your local pub. Check it out! And don't forget to check in on twitter to let other #pdxbeergeeks know where you're at - and what you're drinking for #ACBW! Road Trip for Washington Beer! Northwest Canning Can.... Can you?